Manchuria was a political mess at the turn of the 20th century. Although it was the homeland of the Qing dynasty, the Chinese considered it a backwater. Japan and Russia on the other hand saw it as potential colonial territory, a beachhead for Japan’s mainland ambitions or access to a valuable ice-free Pacific port for Russia. By 1910 an uneasy truce held giving Russia and Japan corridors to build railroads with stations and towns to support them while technically still in Chinese sovereign territory. The importance of Manchuria to global politics and trade was underscored by the presence of European and American diplomatic representatives in these upstart towns and ports. Into this delicate situation, the discovery that marmot fur could be dyed to pass as ermine brought a flood of primarily Chinese hunters into the region. The drive for furs (and marmot oil) led many to cast aside traditional hunting practices and safeguards, setting the stage for the plague to come. The beginning of the plague was sparsely recorded. Starting in October 1910 scattered reports were sent that plague had appeared at sites along the railway, but concern was slow in coming. Summers credits the nearly annual outbreaks of plague, low concern for locals, and the temporary camps of hunters for the lack of information on beginning of the plague. Deaths quickly jumped into the thousands in towns along the rail line but never spread very far from the lines. Summers notes that of the over 43,000 recorded cases during the outbreak only one single person survived (p. 19). Some estimates place the mortality closer to 60,000 when early cases and locals away from the rail line are included. Summers notes that this puts the death toll in the range of the great London plague of 1665. By February 1911, the plague was over; blatant proof the plague outbreaks can flourish in winter (as it sometimes did in medieval European winters). This plague has some unique features. First, there is no report of bubonic plague at all; it was exclusively pneumonic. Most plagues are primarily bubonic with flair ups of pneumonic transmission. Etiology was confirmed by autopsy and the then new bacteriological techniques including culture. American doctor Richard Strong, working with the Chinese under Wu Lien-Teh, did 25 autopsies before the International Plague Conference called by the Chinese in Mukden. There is no doubt the Yersinia pestis caused this epidemic. Without antibiotics, quarantine and isolation were the only effective means of control. The means were brutal but effective. In the Russian zone the Chinese were crowded into train cars and not let out until there were several days with no one displaying any symptoms. If a case of pneumonic plague was locked in the car with others, the prognosis for the others was predictably terrible. Within this relatively small region, we can also see three different national approaches (China, Russia, and Japan) to controlling the epidemic each always subordinated to their respective political anxieties. The chapter on origins of the plague begins to move toward was Edmund Russell envisioned as evolutionary history in his book of the same name (2011). The most useful information here is the history of marmot activity and traditional hunting. Summers hypothesizes that traditional shaman-like practices may have aided hunters in only taking healthy animals. Concern for the health of the animal was one of the early traditions abandoned by hunters eager for furs. Following the reports of the time, Summers believes the plague originated in the marmots, and was distinct from the third pandemic lineage. 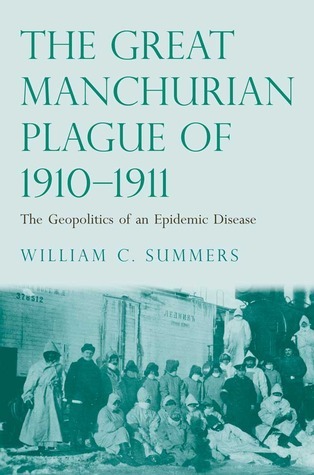 In accordance with modern strain maps, Summers predicts that the 1910-1911 Manchurian outbreak strain will belong to either the antiqua or medievalis biovars (p. 128-9). If this is true, as is likely, it’s a relatively modern challenge to our notion that plague during pandemics has a single lineage and origin. It should be possible to type this outbreak from graves of the epidemic (which should be relatively easy to locate at barely a century old) or even tissue archived from the autopsies (if it was saved and can be located). Summers is clearly in his element when he discusses the politics of turn of the 20th century politics. This is a region and time period that most Americans know very little about but is still critically important for Asian politics today with the still uneasy relationship between China, Korea, Japan, and Russia. Summers account lays out the different approaches to healthcare and attitudes toward the epidemic as a national and economic threat. This carried over to the International Plague Conference that nevertheless managed to focus on science and medicine. While the scientific politics was interesting I would have liked to hear more about the contents of the wide-ranging Conference report. Summers does a good job of being very diplomatic will all parties concerned. In doing so, he does overlook a major legacy of the Manchurian plague. There seems little doubt that this plague, witnessed and closely reported on by Russia, the United States and Japan, played a role in plague being developed as a biological weapon. This plague illustrated the deadly efficiency and sustained transmission of pneumonic plague. This book should be read as a prologue to Japan’s biological ‘experiments’ during World War II beginning in Manchuria (see Sheldon Harris’ Factories of Death) and the continuing programs of the United States and Russia during the Cold War. This book makes a valuable contribution to plague studies, and early 20th century public health practices. Yet there are still unanswered questions on genetics, epidemiology, and ecology. I hope this book along with Myron Eschenberg’s Plague Ports(2007) and others are ushering in a new period of focus on the plague in the 19th-20th century. One reason it may not be so easy to find the remains of victims of the Manchurian plague epidemic is that Wu Lien-teh, the director of Chinese efforts to control the epidemic, burned the corpses of plague victims to prevent the spread of the disease during the cold winter, when it was impossible to dig graves in the frozen ground. True, many if not most were burned but I doubt he got them all especially in areas controlled by Russia or Japan. I suspect there are graves from early in the epidemic. We know that high status people had different quarantine conditions, so I would think they had different, more normal, funerals.